這一個觀念在亞洲還沒有很盛行—“早鳥兒”, 且大家也會覺得好莫名為什麼要早買, 早規劃, 但是在歐美很多地方票價都是會根據旅行時間(是不是熱門日期, 假期), 好時段 (是否三更半夜), 及多少人已在這時段購買而有票價浮動的現象. There is Megabus in UK and in the US and Canada as well, can use it when you are traveling to these two countries also, what’s more they have free wi-fi! 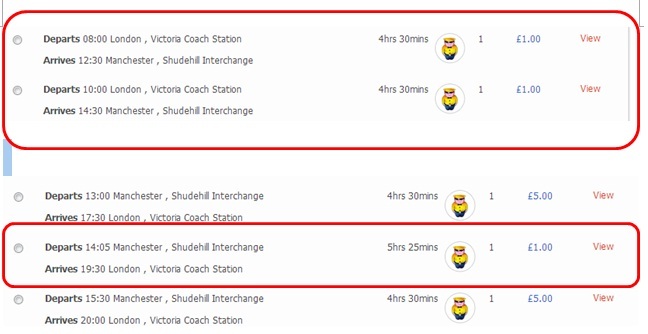 I planned my travel early around April-May, it was absurd that my round-trip from London to Manchaster was only £2.5( including £0.5 transaction fee)!!! Megabus除了在英國有, 美國, 加拿大也有, 好處是: 有免費網路! I would compare the price within Megabus and this, however sometimes Megabus doesn’t go to the destinations I want to go and I’ll buy this. 除了Megabus 還有這一家, 因為有些地點Megabus沒有到, 我就會買這一家, 或是比較兩者的時間與價錢. This would travel from London to other places in Europe, however the hours on bus is longggggggggggggggggggg, can think about taking trains or plane. In Europe they are very generous to youngster as thinking they should go out to explore the world more that young adults 19-26 all have a special price, however you have to buy a young adult card for discounts. I kinda forgot how it go, anyway the train lines in UK is massive and operated by different companies depending their routes and area. Above are some I still remember, remember to check all the train line, since I remembered one operate from London-Edinburgh takes 9 hours, and found another one only 4.5 hours…huge differences! 英國鐵路很複雜, 每一條是由不同公司負責的, 有一點忘了哪一條是哪一條的, 但是請多查查, 記得再查怎麼從倫敦到愛丁堡有一家鐵路公司開9小時, 另一家開4.5小時 ..差別很大噢, 所以多查多查. This is a budget trip, below will introduce budget airlines in UK and Europe. 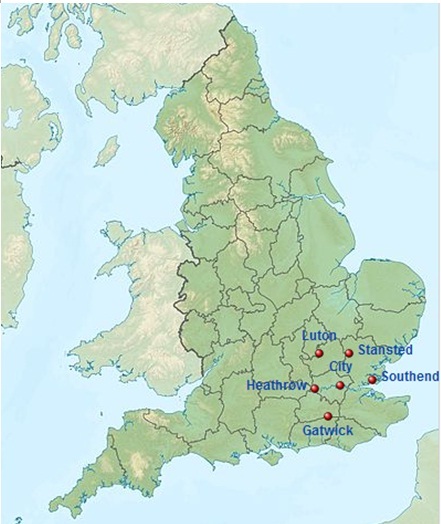 There are 6 airports in London. Don’t get confused and be aware of the distance where you live and how transportations will take you there. 要買低成本航空機票就要當 “早鳥兒”, 票價會根據旅行時間(是不是熱門日期, 假期), 好時段 (是否三更半夜), 及多少人已在這時段購買而有票價浮動的現象. Easy Jet is the largest LCC (low cost carriers) in EU, flying 203+routes to over 61 cities within Europe to Baltic Sea. Fares start from €20, early birds can grab tickets from €20~€60. Irish well-known LCC in Europe has many routes, often has discounts, fly from Ireland, UK to 17+ airports and 50+cities in Europe. One of the largest LCC in UK, mostly fly domestic in UK, international to Spain, The Netherlands, Czech Republic, starting fares from £20. I think the look of the aircraft is very cute! There are many great ways to explore UK without making a hole in your pocket.